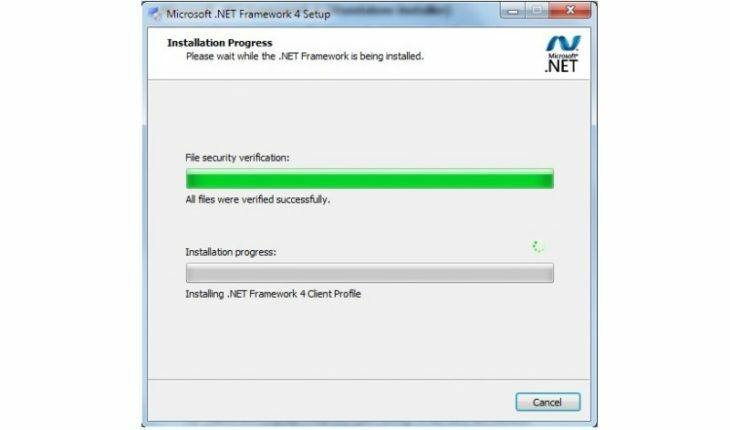 Solve the .Net Framework 4 freeze during installation problem easily. It happens, sometimes .Net Framework 4 stuck on installing .Net Framework 4 Client Profile at 0%. No matter what you do: restarting installation, downloading full install does not solve the problem. Try those simple steps to solve the problem. Try completely disabling your system Windows Updates and the restart your computer. After that try installing .Net Framework 4 as system administrator. If that does not help you can use Dotnetfx cleanup tool. There is possibility that somewhere is corrupted setup files, that prevent setup from completing. Found another way to solve the .Net Framework 4 freeze during installation problem? Leave a comment below. There is another way with the same procedure, you can fix this manually. – You should be in C:\Windows\System32 now. 3. Restart the .NET FW installation proccess. Samdx , I just want to say thank you, your instruction save my time and it works. Great article. I can confirm that samdx’s method is spot on as well. Thanks for sharing! Should we rename back software distribution after installation ? Thank you for this! I was pulling my hair out trying to figure out this crap the last two days! Disabling Windows update and a system restart did the trick for me. This solution saved me a lot of trouble. Thanks Samdx. Samdx, your solution worked perfectly! Disabeling updates and rebooting did the trick form me. worked for me too! greatly appreciate this article. Woah! Thanks bro! It worked for me!! I’ve been searching for how many days on how to fix this problem! Thanks! Thank you very much. Disabling windows update and restarting worked!!! Should we rename back software distribution after installation? No nee, a new SoftwareDistribution folder will be regenerated automatically. Thank you man. Works great…. Earlier today, I was spending hours trying to solve this problem. Then I found this article, and the problem was solved within 10 minutes. Sadly, this failed for me! Oh, well! Exe (C:\Users\CALDES~1\AppData\Local\Temp\Microsoft .NET Framework 4 Setup_4.0.30319\Windows6.1-KB958488-v6001-x64.msu) failed with 0x240006 – (null). Final Result: Installation failed with error code: (0x80070643), “Fatal error during installation. ” (Elapsed time: 0 00:02:12). Control Panel, Windows Update, on the left panel selected Change settings. Under – Important updates – change to – Never check for updates. This Turned off Windows update. Restarted the PC. Installed The Printer disc. Restart PC. Go back in and select your options for Windows updates. Worked for me on Windows 7 Proffesional. I didn’t have to following step: Move/Rename/Delete the `C:\Windows\SoftwareDistrubution` folder. Kudos for you! This page should be the first result on google! For me the first tip “desactivate windows update” worked fine. And God knows haw many unsuccessful workaround I had tried before. This page should definitely be the first result on Google when typing “Microsoft Net Framework 4 freeze”! I spent 3 hours trying to fix this problem and it was as easy as restarting the computer, disabling Windows Updates, applying the cleanup tool and installing the NET Framework again. Thank you very much!